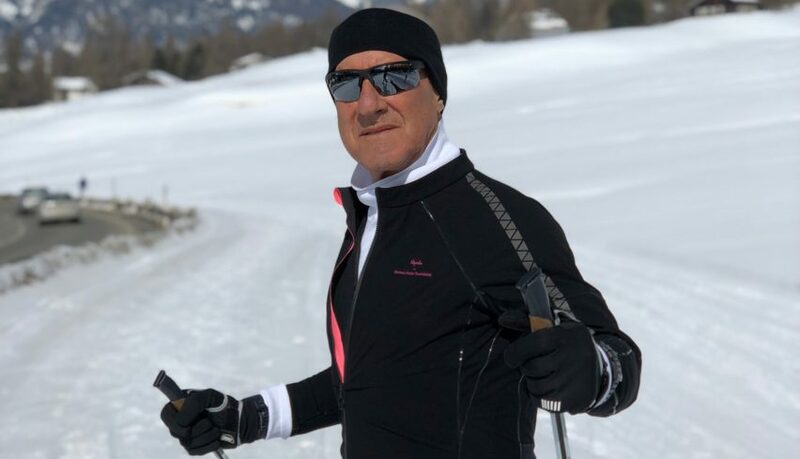 Architect Norman Foster has revealed that he is working with cycling brand Rapha to create a range of cross-country ski gear. The founder of Foster + Partners revealed the collaboration between the Norman Foster Foundation and the cycle brand in a post on Instagram. The caption reads: "Just received the prototype of my design in collaboration with @rapha for a new range of cross country ski gear. In time to test tomorrow for my 25th cross country ski marathon - weather forecast is absolutely terrible - warm and rain - going to be slow and hard!" In the post, Foster is seen wearing the prototype ski wear, which is black with pink accents. The phrase "do more with less" is written using perforated holes on the coats lining behind the zipper. This phrase is a key part of ephemeralisation, a concept devised by architect and inventor Buckminster Fuller, who collaborated with Foster in the 1970s. Foster previously announced another collaboration with Rapha via his Instagram page – last year he announced he was working with the brand on a range of clothing for cyclists. A keen cross-country skier, Foster regularly posts about his winter sports activities on Instagram – which he only joined in March last year. The architect established the Norman Foster Foundation in 1999 to support the next generation of architects and designers. Photographer Jose Manuel Ballester recently took pictures of the foundation's archive in Madrid for his book Spaces. The archive includes a range of items, including a car once owned by architect Le Corbusier, models of the practice's work and drawings by the architect, including his collaboration with Fuller on the Samuel Beckett Theatre. Foster + Partners recently pledged to take action on gender diversity in response to Dezeen's Move the Needle initiative. The commitment came after the practice revealed its gender pay gap between female and male staff. The firm came in ninth on the 2017 Dezeen Hot List of influential names in architecture and design.